I have an extra Kohala tree that I was thinking of trying this with. Would need some budwood too. I guess it should be easy to come by since most people aren't grafting Lychee other than Emperor is that right? Might be good news for some of the more rare varieties, as I think the barrier to getting them was needing to get live trees as opposed to just scions. Oscar, from my own experience and from discussions with a few nurserymen, it appears that Emperors do not thrive on their own rootstock. I'm not sure if it's because Emperors dwarfing habit doesn't allow it to thrive or if it's just more sensitive to high pH. One nurseryman told me that Emperors on their own roots are very sensitive to high pH and also to city water. I am just going by assumptions but I do feel that Lychees, especially Emperors, grafted onto Longan rootstock may benefit from the more robust and tolerant root system of the Longan. Simon, I have plenty of longan root stock and an Emperor, and No Mai Tsze, I've been wanting to experiment with. Mark, let's call it a party. I've got another idea I'm throwing around. I planted lots of Lychee seedlings and I would like to innarch the seedlings with Emperor rootstock. Quang grafted Emperor onto different Lychee rootstock but it's still early. If Emperor thrives on seedling rootstock, that could be a great technique for increasing the survivability rate of Emperors without the troubles of grafting onto a different genus. If both techniques work, I wonder which one will grow better? Emperor grafted onto seedling Lychee will have tap root but Lychee grafted onto Longan may still have more vigor and be better suited to city water and highly alkaline soils. I guess there's one way to find out. If lychee longan graft is so easy then what about having cocktail tree with both fruits on one tree? Exactly what I was thinking. Today I had a friend help me grafted sweetheart, Mauritius, and Brewster lychee onto my longan tree. Will update once I get some progress. Great ideas everyone. Fruitforme, please keep us updated, you could save some of us a lot of time. If one or two of your grafted varieties takes on your Longan rootstock, that would lead me to believe that the Lychee and Longan are more compatible than we thought. This also makes me wonder why we haven't heard more about Lychees grafted onto Longan? There must have been others that have tried this, I'm sure I've read it somewhere but perhaps the benefits of the grafted plants aren't as beneficial as believed or the cost and labor are too high for commercial production. I wonder if there is any papers on long term compatibility? 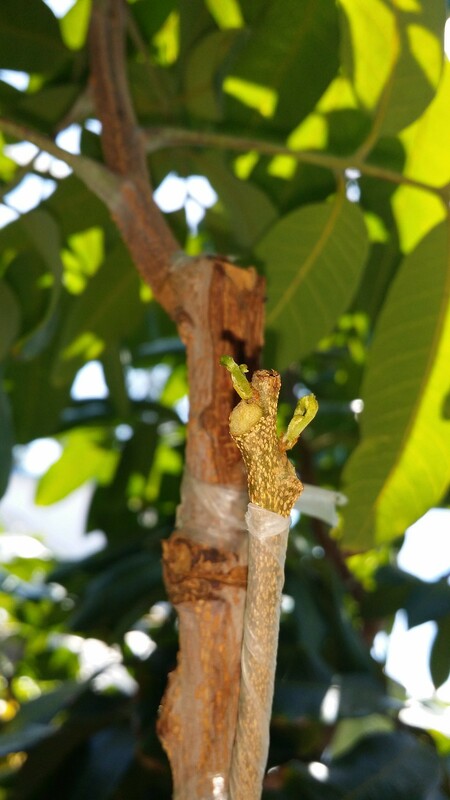 If the grafted trees are fully compatible and vigor is conveyed, I would expect many Lychee farmers to be using this technique. Perhaps it would be more beneficial to farmers living in the USA growing in high pH soil? I bet Bill Mee would be interested. I wonder how a multiple rootstock, one Longan rootstock one Lychee rootstock, Lychee tree would do. Perhaps more is not always better but why wouldn't an extra Lychee rootstock prove beneficial? 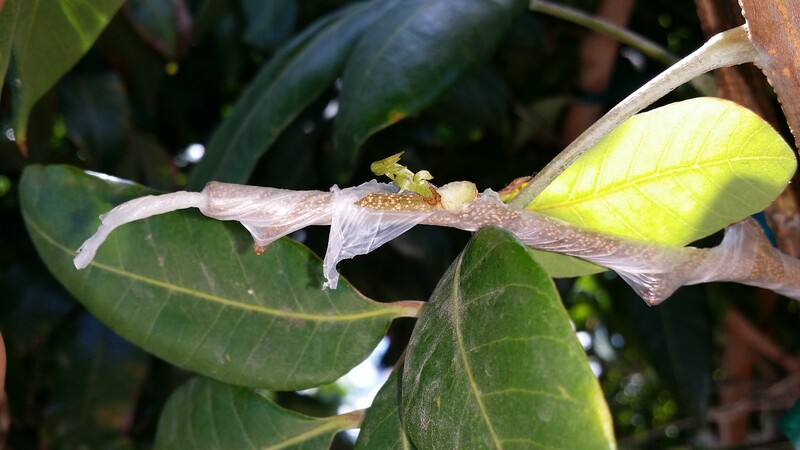 Maybe this is a simplistic answer, but a large part of the reason that more might not have been done on this topic is because usually both lychee and longans are propagated by air layers, not by grafting. I have been failing to graft with success Lychee on Longan for over 3 years but decided not to give up. let me tell you, its not easy to get a take, specially on a matured longan tree unless you topwork it (I might give it a try). what might have gone in my favor could be timing, compatibility (cant confirm), and seedling vs. matured longan as rootstock. Those interested in this project, give all your tries and have faith. Persistence pays. document what you are doing so it can be used by others as basis of success. UPDATE on one of my Mauritius on longan graft. It's starting to push nicely. Im so excited! Congrats on your "Max"imum takes!! Looks like there will be more fruit4you in the future. I did 3 sweetheart on kohala a little over month ago. There are some green buds swelling. I am also excited to see if these will really push in the next few weeks. Sometimes we can get away with grafting annona and mangos in the peak of winter but timing is very crucial for these longan and lychee grafts. congrats Fruitforme. its funny that these things can be done if conditions are right. mine is taking a breather before it flushes again I hope. other graft is still into its first flush. two other experiments failed. I don't know for sure what variety longan i have. If i had to guess, probably a kohala. For this lychee scion, i used a piece that was still greenish to slightly woody with buds that hasn't pushed. I think as long as the rootstock is active and the scion is mature enough, the percentage of getting take is very high. Or could be just pure luck on first try as well. Thanks Xshen! Hope to see some of your sweetheart grafts exploding with growth! Behl, thanks again for sharing this with us not giving up. Now just hoping for the long term compatibility. Nice job fruits4me, did you just graft in July or June? Congrat's your acquiring a nice collection!! Here are a couple of Sweetheart on Kohala grafted a month and a half ago. It's still early to say they took but they're all leafing out. Grafting longan on longan seems to be a more difficult task. Nice work Xshen! Seems too easy to be true. I'm waiting on some scions to try this on emperor. Hopefully, it works as well. Are you guys/gals going to remove some nearby Longan growth to redirect more energy into the Lychee scions? This type of grafting looks really promising from preliminary results. I performed my first Lychee grafted onto Longan a couple days ago. I used Kaimana as scion and Kohala as rootstock. Unfortunately, my Kaimana had already pushed several inches of new growth so I'm not holding my breath on these grafts. I tried to look for other dormant buds on my Kaimana and found a few along with a few buds that were just starting to push. Here are a couple pictures of Lychee buds. Simon, are these grafts? I don't see that you wrap these scions?